Blog hops are a wonderful way to make new Bloggie Friends and gain new Followers for your blog (or Twitter, Facebook, whichever your linking to on the particular hop - my hop links up 6-ways)! If you plan on participating in a blog hop, there are a few guidelines every hopper should stick to. 1. Make sure you are linking up and commenting on the Most Recent Hop Post! 2. When linking to your blog, write a post stating your hoping. Not only to let your blog readers know your participating in a Hop, but more importantly, if you want others to follow you back, give them a specific post to leave a comment on. Your post does not need to have a linky or be complicated. It can be as simple as, "Blog Hoping Today, come join me!" It's common courtesy to include the button of the hops your participating with in your post, or somewhere on your blog. 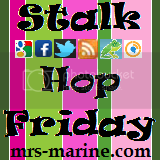 New follower from Finding Friends weekend blog hop! I love the tone of your blog! Come say hi soon!